Prolific online database miner Tum Apisak has unearthed another AMD branded gem. Earlier today he shared a link to a benchmark featuring an interesting AMD engineering sample processor. Tum shared this link with no speculation about its origin. However, Paul Alcorn from Tom's Hardware thinks that the chip could very well be a 12C/24T Third-Gen AMD Ryzen 'Matisse' CPU. In the UserBenchmark database the AMD engineering sample is identified by a serial code as follows: 2D3212BGMCWH2_37/34_N. Apparently the H2 suffix in the main section of the code string signifies a Matisse processor. Beneath, in the same section, it says that the processor features 12 cores and 24 threads, and it uses the MA4 socket. In brief its benchmark result is classified as 'outstanding' and is in the top five percent of results available. It is also worth noting that this same info section gives the base clock as 3.4GHz with average boost clock of 3.6GHz. Pondering over other system information data provided by UserBenchmark we can see that the Matisse chip was tested on AMD's Myrtle AM4 test platform. TH says that somewhere in the results it says that the 12C 24T Matisse has a 105W TDP, too. Scrolling down the benchmark page reveals the 'system memory latency ladder' graph which indicates that 32MB of L3 cache features in this CPU design – see the steep latency change between 16 and 32MB. It is interesting to compare the Engineering sample CPU's single-core floating point score to a current-gen Ryzen 7 2700X. AT roughly the same clocks the new 7nm processor delivers an approx 13 per cent uplift in this metric. The positive change is therefore likely a sign of improved IPC due to Zen 2 architectural tweaks. 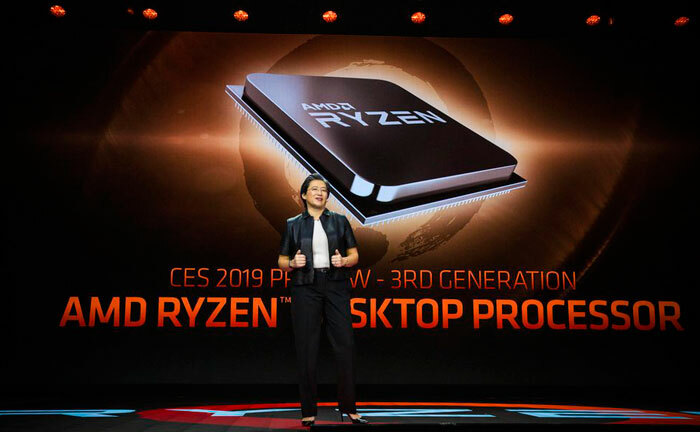 At the AMD keynote during CES 2019, Dr Lisa Su hinted strongly that 3rd gen Ryzen processors would feature more than eight cores. The Matisse design leaves room for another chiplet and thus "you might expect that we will have more than eight cores," Dr Su told PC World in an after-show interview. 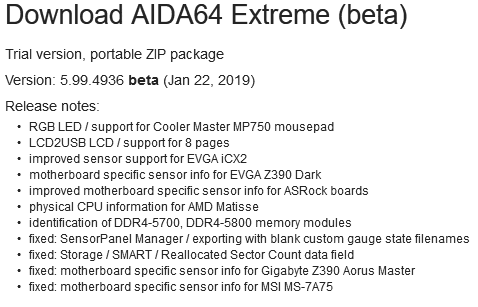 In related news, earlier this week the latest test beta of AIDA64 Extreme was seen to add support for AMD Matisse Zen 2 processors. A screenshot of the release notes, mentioning AMD Matisse, is provided below. and it uses the MA4 socket. Obviously that should say AM4. Weird question, AIDA is a clinical diagnostics suite on a particular brand of pacemaker. Coincidence or some weird crossover? Can't tell if you're not familiar with AIDA64 or if you're just calling a bluff on the “coinkydink” that AIDA64 is the first system analysis/benchmark tool supporting AMD's “Matisse”. AIDA64 has been around for ages (at least 15 years if not more). There's also a version for Android, if I remember correctly. As for “Matisse” itself, I'm getting more hyped every time I read something about it. I *really* hope it isn't unjustified. tbh the most interesting thing in this whole story - which is getting ignored - is the cache latencies. The lack of a latency spike at 8MB suggests that either the compute die is a single 8 core CCX (which others have speculated but I was skeptical of) or that they've completely fixed the inter-CCX communication delays on the compute chips. Now, since the compute chiplets would have their own on-chip fabric connecting the CCXes, it's not inconceivable that they've been able to tune that fabric to remove the latency between CCXes completely, since it's no longer part of a larger domain including the memory controller. Nah I was just wondering if it was some engineering thing. We get a lot of stuff in my area which is applied to humans which comes directly from engineering stuff. I assume it is brought in by the engineers who have moved into the medical tech companies and thought “I wonder if we could apply this”.